Since the NCAA tournament expanded to 64 teams in 1985 — its modern format — only four of 34 national champions were unranked to start the season. That’s about one in every 8 years. The first may be most memorable. In 1985, Villanova — coming off of a 19-12 season that ended in the second round of the NCAA tournament — was left out of the preseason poll. The Wildcats responded strongly, starting the season 8-0, enough to get them in the AP Poll for six weeks. But Villanova finished its last nine games of the season 4-5, terrible momentum heading into postseason play. The Wildcats received an 8-seed, giving them one of the toughest paths to a Final Four, but it didn’t matter. They won five games in a row to secure a matchup with the Patrick Ewing-led, No. 1-seed Georgetown Hoyas, and beat the clear favorites in remarkable fashion to become the lowest-ever seed to win a national championship. In 2003, Syracuse wasn’t ranked to start the year after a second-half collapse in the 2002 season saw the Orange head to the NIT. But in 2003, Syracuse won 11 out of its last 13 games, climbed to No. 11 in the AP Poll by March, and entered the tournament as a 3-seed. There, led by freshman Carmelo Anthony, the Orange won six straight, beating Kansas in the championship game. In 2006, unranked Florida won 17 straight games to start the season and quickly found itself No. 2 in the AP Poll come January. The Gators then went 7-6 in their final 13 games of the regular season, sliding to No. 16 in the poll, before winning the SEC championship and securing a 3-seed. They would go on to beat UCLA 73-57 for the school’s first-ever national championship, and would even repeat as champs the following year. The most recent unranked team to win the title came in 2011. After 2010’s 18-16 campaign ended in the second round of the NIT, UConn failed to make the preseason Top 25 in 2011. Then the Huskies started the year 17-2 and shot to No. 4 in the AP poll. A 4-7 record to finish the year left UConn with a No. 3 seed come tournament time, but the Huskies — powered by junior guard Kemba Walker — won six tournament games by an average of 10.3 points per game and defeated Butler 53-41 for the program’s third title. 2009 UNC 1 5 1 2 1 34-4 Mich. St. There is a flip side to this, of course. Just being ranked in the preseason does not guarantee success. 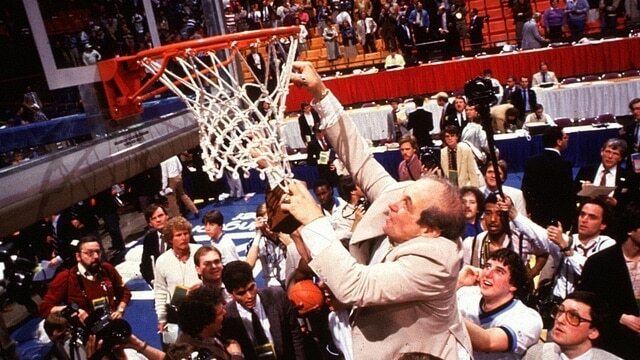 Since 1985, approximately four teams ranked in the preseason poll fail to make the tournament every year. That includes 23 teams ranked in the Top 10, and even a preseason No. 2 and No. 3. A year after going 32-7 and winning the program’s second national championship, Louisville entered the season ranked No. 2 in 1987. And then, disaster. Louisville lost three games to unranked foes to start the year and was 3-6 through its first nine games. The Cardinals were out of the rankings by the first regular season poll, failed to make the tournament, and finished 18-14. More recently, Kentucky was ranked No. 3 to start the 2013 season, but lost three of its first seven games, with two of those losses coming at the hands of unranked opponents, and was promptly out of the Top 25. The Wildcats would make a brief appearance at No. 25 in February, but were out again the very next week. Kentucky would finish 21-12, losing to Robert Morris in the first game of the NIT.